Russell Hancock is the pianist for the Saint Michael Trio, and a member of The Church of Jesus Christ of Latter-day Saints, the Mormon Church. Daniel Cher on violin and Michel Flexer on cello complete the trio. 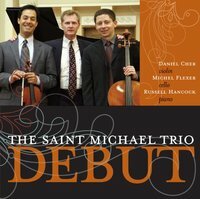 Critics call the Saint Michael trio Silicon Valley's update to the classical music scene, coming out of the tech sector with talent their office-mates probably never knew they had. Though classically trained and highly experienced on the concert stage, each of the artists have thriving careers in the private sector. As a soloist, pianist Russell Hancock's most recent concerto performances include the Redwood Symphony, Saratoga Symphony, Ohlone Chamber Orchestra, and the Oakland Temple Hill Orchestra. Recent international engagements include Kuang-Jen Conservatory in Taipei, and a lecture-recital in Mexico (Centro Estaca, Tapachula). By day Dr. Hancock is President & CEO of Joint Venture: Silicon Valley Network. The group has become the West Coast's (USA) premiere piano trio. In addition to being stunning chamber virtuosi, their repertoire grooves from classical to modern and even jazz and rock. They make their concerts interesting, funny, and accessible through lively dialogue and commentary. This page was last edited on 11 April 2011, at 16:19.